Made of Stainless Steel construction, fully welded hinges prevent tampering and meet the demands of daily use. Includes a secure locking mechanism. 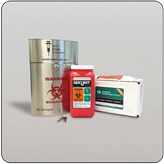 Holds one 1.4 quart sharps container (included with the starter kit).